KOKOMO, Ind. – After months of speculation, Indiana University Kokomo finally made official what many suspected – the Cougars will add women’s basketball to its slate of varsity sports beginning with the 2014-2015 season. And they didn’t have to look far to find a coach. 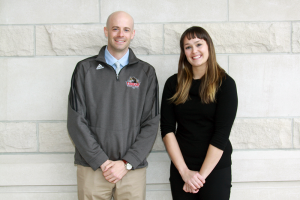 Whitney Farris, an assistant coach with the IUK men’s team and a 2006 Kokomo High School graduate, will take the reins of the program beginning immediately. Cougar Athletic Director Brandon Podgorski, who announced the formation of the new sports program, said he is thrilled the college could hire a coach from within the Cougar athletic program. He said that the formation of the women’s basketball team keeps the athletic program on pace to meet NAIA program requirements of at least six teams. The women’s hoops team joins the men’s team, women’s volleyball and men’s and women’s cross country. A sixth team will be announced in the near future. Todd Gambill, IUK vice chancellor for student affairs, said the dual announcement of the formation of a women’s hoops program and hiring its first coach was exciting for the Kokomo school. Farris is a self-professed basketball junkie. But her hoops knowledge is not just from hitting the books; it is from years of action on the hardwood. She played four years of varsity basketball for the Lady Wildkats and helped the team win the 2003 IHSAA Class 4A state title with a perfect 26-0 campaign. A McDonald’s All-American nominee, Farris was a two-time All-North Central Conference performer and played in the Hoosiers Reunion All-Star Classic. She earned 12 letters at Kokomo in four different sports, and she excelled outside of the classroom as a member of the National Honor Society. Following her success at Kokomo, she was a four-year performer at the NCAA Division I level at Valparaiso University, where she graduated with a degree in business administration (marketing emphasis). A 5-11 guard/forward combo player, Farris played in 90 consecutive games her final three years at Valpo. Her senior season, she averaged seven points, four rebounds and was second on the team in assists. Her junior year, Farris helped lead the Crusaders to regular season wins over No. 1-ranked Florida State and Purdue. Farris was also an academic all-conference honoree. Farris said she plans on using her connections at the high school level when she starts recruiting. She noted that while she lacks experience as a head coach, she has been around the game for years in a non-playing capacity. She has worked as a camp counselor for the Notre Dame women’s basketball team. At Valpo, she served as the assistant for the women’s basketball summer camps and was a counselor at the men’s basketball summer camps. Last summer, she was a part of the staff at the Purdue women’s basketball junior skills camp. And of course, spending two years working with IU Kokomo men’s coach Jace Thompson has helped. Whether it is winning a high school state championship or knocking off the top-ranked college team in the nation, Farris is a proven winner on the court. Her next challenge will be proving she can take that experience and use it to garner wins as a college head coach. And she will begin that journey in her hometown. It appears the IU Kokomo women’s basketball program is in good hands. This entry was posted in Basketball, Cougars, IU Kokomo. Bookmark the permalink.